I turned up on a Saturday lunchtime, without a reservation, but was immediately seated. I was treated to the considerate and attentive service that the restaurant’s website promises. The staff were without exception friendly, courteous, and informal. I overheard two of them speaking English with other customers and they were very proficient. The dining room at the Angiol d’Or. Most of the dining room is in a large conservatory, which looks like it can be dismantled in the summer to allow al fresco dining. It’s literally next to Parma Cathedral and affords views of the famous thirteenth-century baptistry. The decor is modern, elegant without being too formal. With one or two exceptions, the menu was authentically parmesan. As it was lunchtime, I decided to go for a primo and secondo. For the primo, I chose tortelli d’erbette, a traditional pasta dish from Parma. The waitress suggested that I could have a taste of the three versions of tortelli on the menu if I wanted. I thought that was a great idea and so I was brought a mixed plate of tortelli d’erbette (pasta stuffed with chard), tortelli di zucca (pasta stuffed with pumpkin), and tortelli di spalla cotta (pasta stuffed with spalla di San Secondo, a local cold meat). The pasta was cooked perfectly and was served tossed in butter with just enough parmigiano reggiano cheese to give it the flavour, without overpowering the fillings. There were two large tortelli of each kind, so I worked my way through the first three in the order they were on the plate and then the second three in order of preference. I ate my least favourite (zucca) first, followed by erbette, and finishing up with the spalla cotta. It had a slightly tangy sausage flavour to it which I found delightful. Next time, I’ll order a whole plate of them. They were all very good, however. For the secondo, of course, I’d already decided on the Rosa di Parma, which was served with homemade chips (very light and fluffy without a hint of grease). The dish consists of fillet steak which has been butterflied, beaten very thin, and then rolled with prosciutto di Parma and parmigiano reggiano cheese (the two products Parma is most famous for) inside. It’s served in rose-like slices with a marsala wine sauce. The famous Rosa di Parma. My first impression was that the meat was perhaps slightly overcooked, but as soon as I got to the ham and cheese filling I was reassured. It was everything I’d hoped for and has now given me a benchmark against which to develop my own recipe. Watch this space. Inside the Rosa di Parma. Although by this stage I was feeling quite full, a quick glance at the dessert menu helped me decide to continue. I chose the salted caramel semifreddo with amaranth popcorn and chocolate sauce. The aspect was lovely, although I think the chef had been a little heavy on the salt. However, the sweetness of the chocolate sauce around the edge did tone it down. In any case the presentation was beautiful. The wine list was well constructed. Angiol d’Or has a small cellar of local wines and others from further afield (mostly the neighbouring region of Tuscany). Wine by the glass is not marked on the list, but if you ask they are happy to serve almost any of the wines on the list as single glasses. I went for a local Malvasia (white) to accompany the pasta and a robust local Sangiovese to go with the Rosa di Parma. Coffee was accompanied by homemade petits fours (brownie, lemon biscuit, and hazelnut brittle). As a lone diner, I was given a double portion, which I appreciated. The meal was not cheap, but not overly expensive. For the ambience, the location, and the quality of food and service, I would say that it was good value. 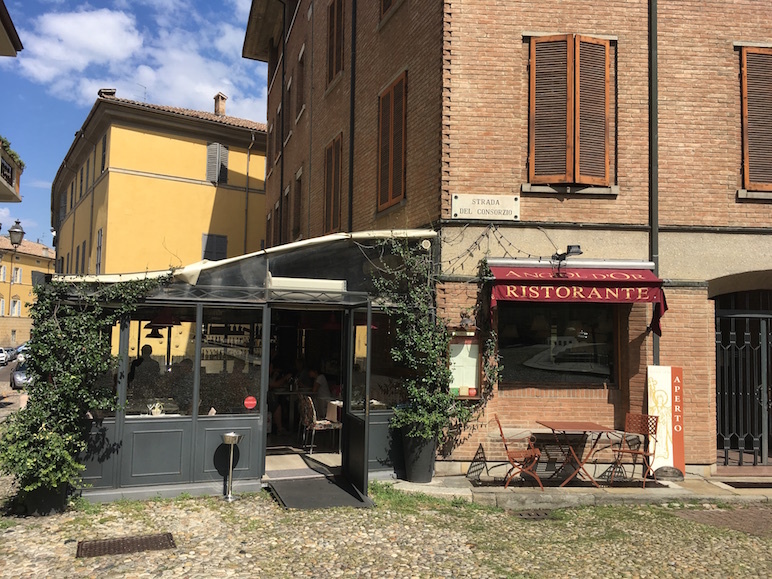 It will definitely be my go-to restaurant if and when I return to Parma, and I would say it should be yours too. Angiol d’Oro, Vicolo Scutellari, 1, 43100 Parma, Emilia-Romagna, Italy. Open Tuesday-Sunday 12.00-14.00 and 19.00-22.00. A meal like the one described costs about €50 a head including drinks and service. Everything looks delicious of course, but the torteli look absolutely amazing. They are obviously homemade yes?